A quick, but interesting, history of the Day of the Dead. 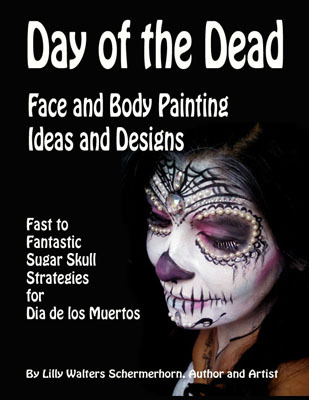 A brief overview of the materials used in face painting Day of the Dead designs including: paints, powders, split cakes, brushes and bling. 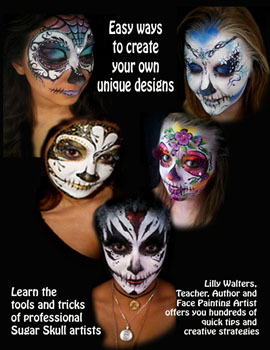 Tips to turn a living face into a skull, then turn a skull face into a sugar skull. Suggestions and illustrations on how much of the face to cover and where to stop the design. Illustrations, descriptions and examples of Sugar Skull: eyes, ears, noses, teeth and cheeks, simple folk art style, to the more elaborate. Suggestions and examples of decorating, shading, and coloring techniques. Tips on how flowers are used, and a step by step on how-to create a very simple rose. Step by step on creating webs. A few techniques about line work. Examples of the amazing art of 12 artists from around the world: Mark Reid, Nick Wolfe, Annie Reynolds, and more!